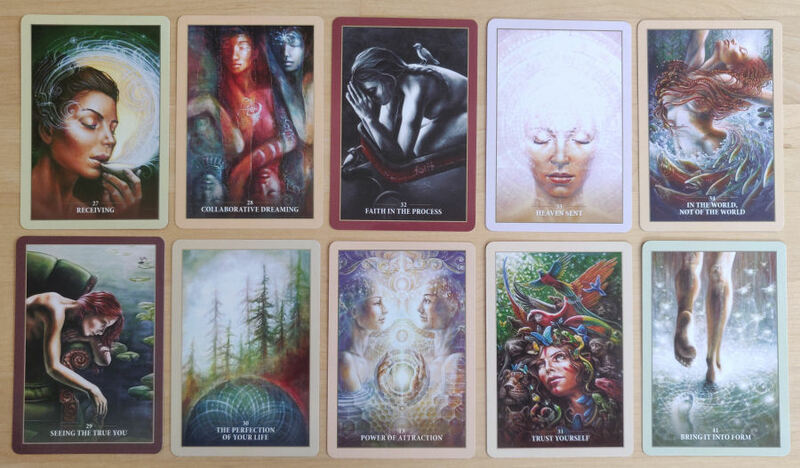 On the year of this blog posting, the Sacred Rebels Oracle deck is now five years old. I’ve had it for a while now, and only now have gotten around to sharing my impressions of it. 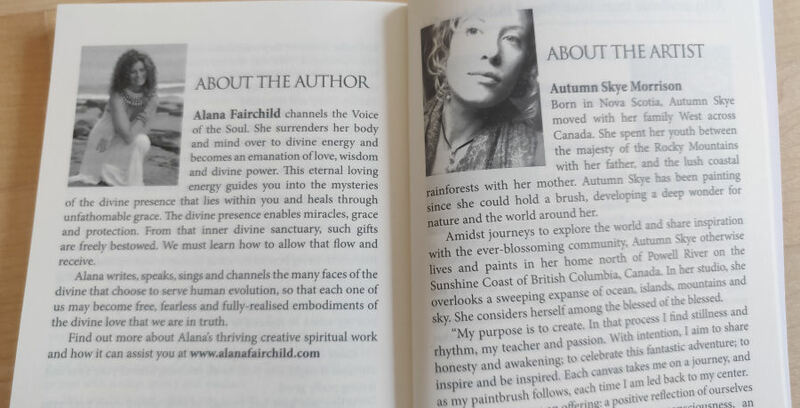 The deck is by Alana Fairchild, one of the reigning voices in New Age spirituality. Personally, I love the deck art, I love the spirit of what this deck is trying to achieve, and overall production design is lovely. However, it would be remiss of me as a person of color to not also mention that many people of color do have some bones to pick with Alana Fairchild decks. An argument can be made that she culls from the surface of cultural and religious traditions that she doesn’t fully study or immerse herself in, and then photoshops those traditions through a White lens. 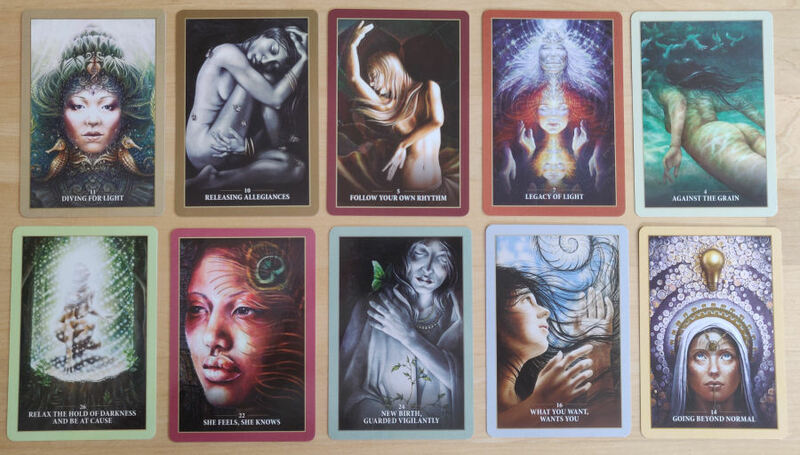 Instead of trying to sway you one way or the other, let’s just walk through the card images and you can decide for yourself how you feel. Sacred Rebels is premised on the celebration of individualist spiritual paths, refusing to follow tradition, orthodoxy, or the mainstream, in pursuit of living your own personal authentic truth. I totally get behind all of that. Fairchild is a poetic writer and I absolutely believe she is dialed in to some sort of otherworldly naturalistic energy. Her prose comes across channeled, beautiful, and lyrical. That said, she and I may have very different perspectives on what “rebel” looks like. I really didn’t get the sense of rebellion from this deck, like, at all. In fact, the opposite. It felt like mainstream New Age spirituality to me. There are a total of 44 cards in this deck. Apologies for the cards not appearing in numerical order here. I’ve had this deck for a while and have been using it. The different colored borders intrigued me and I wracked my analytical brains over what the symbolic purpose might be for the different colored borders. Is it elemental related? Maybe astrological? 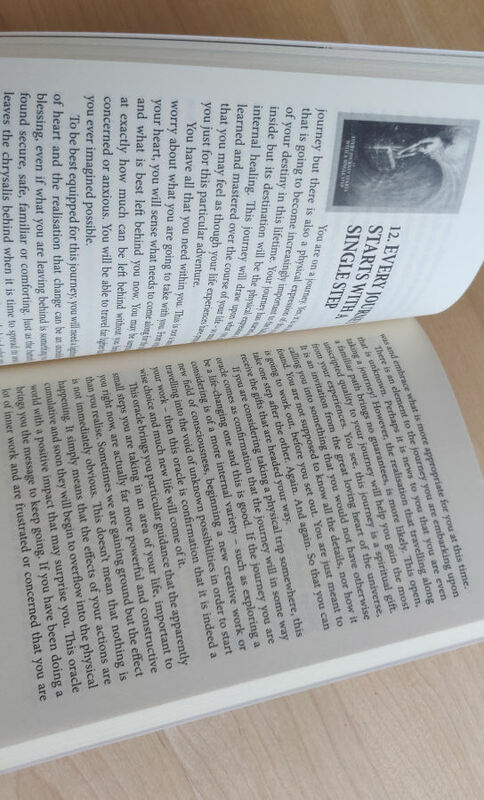 I couldn’t find anything in the book to explain the borders, so perhaps it was purely an aesthetic decision. I do like it, though. Everyone connects to decks in different ways. For me, these types of oracle decks do necessitate contemporaneous use with the guidebook. That’s because I’m one of those who really want to know the deck creator’s intentions and first immerse myself in the cultural perspective of the deck creator to better understand the symbolic associations. Here, Fairchild doesn’t disappoint. She gives generous content for each card entry. I love that the guidebook describes the imagery, is written in second person so it draws you in and the card entry itself feels like it’s part of your divinatory experience. 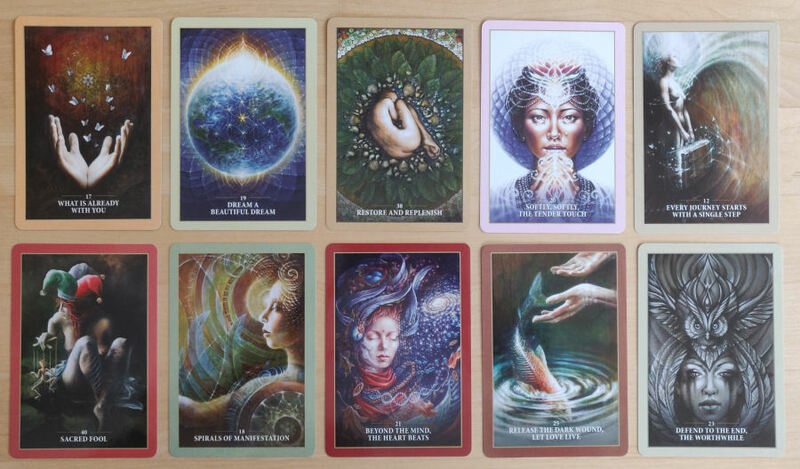 There is also a section provided for each card titled “Healing Process” that offers spiritual exercises to help facilitate personal healing or wellness while using Sacred Rebels. 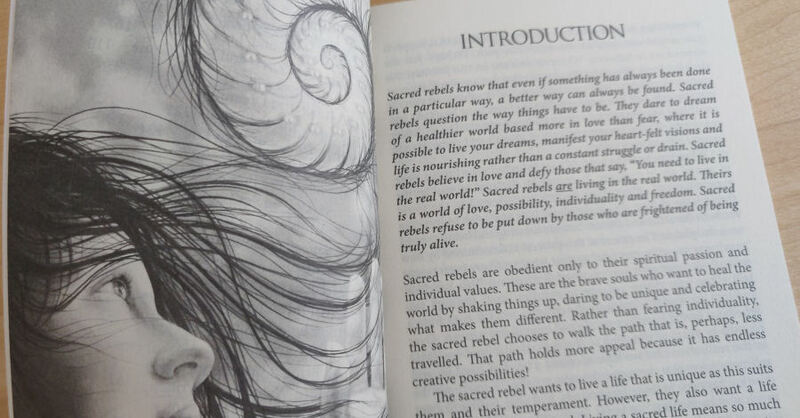 There’s a soothing quality to Sacred Rebels that helps with anxiety. It has a unique power to calm you down, make you feel less alone in this world, and to envelop you with a sense of being protected by much greater beneficent and nurturing forces in this world. 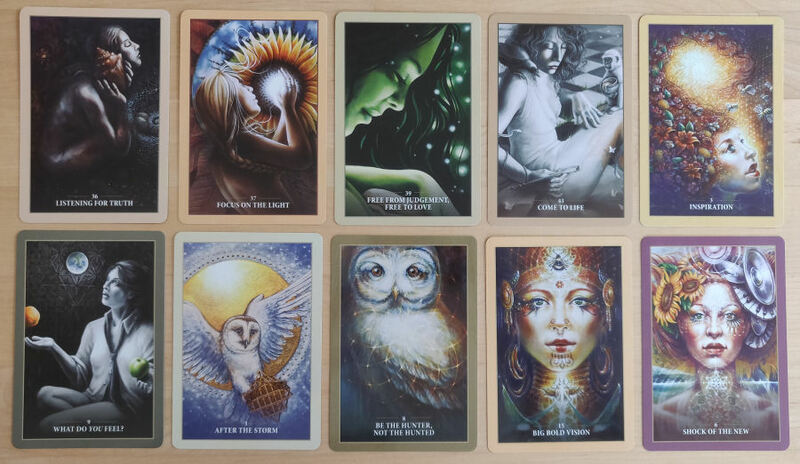 As I’ve always said, Fairchild does an incredible job tapping in to those forces and expressing them in written and pictorial form for you through her oracle decks. The art, by the way, is exquisite. Funny enough, before I read through the guidebook, or checked the product description on the box, I thought this deck was illustrated by many different artists. There’s a subset of grayscale sketched illustrations, then high fantasy mythical digital art, and even the interplay between dark and light tones on the cards change notably in terms of style. Some of the women depicted on the card art feel raw and realistic, wholly contemporary, while others have a fairytale folkloric style to them. So I was intrigued to learn all of the art is by one single artist, Autumn Skye Morrison. Morrison’s paintings are really magnificent. There’s a deeply moving humanist quality to her art. She has this incredible talent for bringing realism and naturalism to fantasy. Also, now that I know that all the art here is done by her, I’m also in deep admiration for her versatility as an artist. Versatility is a very, very difficult talent and technique to come by for an artist. When I’m critiquing the deck with objectivity, I see that Sacred Rebels taps in to a divine harmony that brings a calming sensation to many. It’s a great deck to work with for soothing your stress and bringing down anxiety levels. 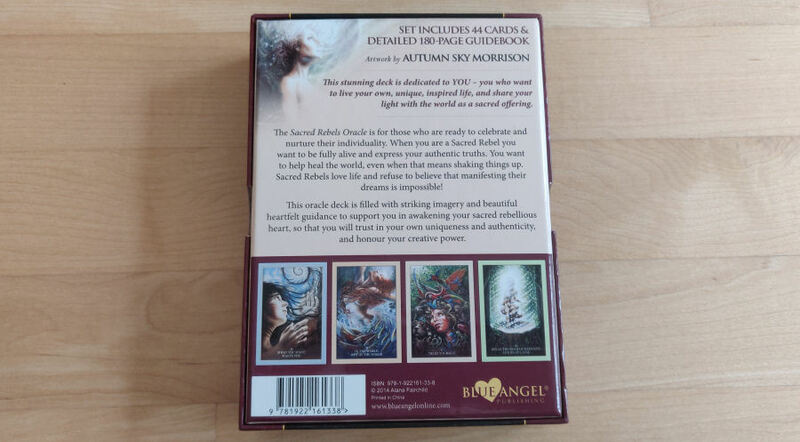 The captions evoke happiness in the inner child: Dream a Beautiful Dream– Release the Dark Wound, Let Love Live– Releasing Allegiances– She Feels, She Knows– Faith in the Process– Trust Yourself– The Perfection of Your Life– there is absolutely a good reason why Sacred Rebels has endured as a bestselling oracle deck for so many years. 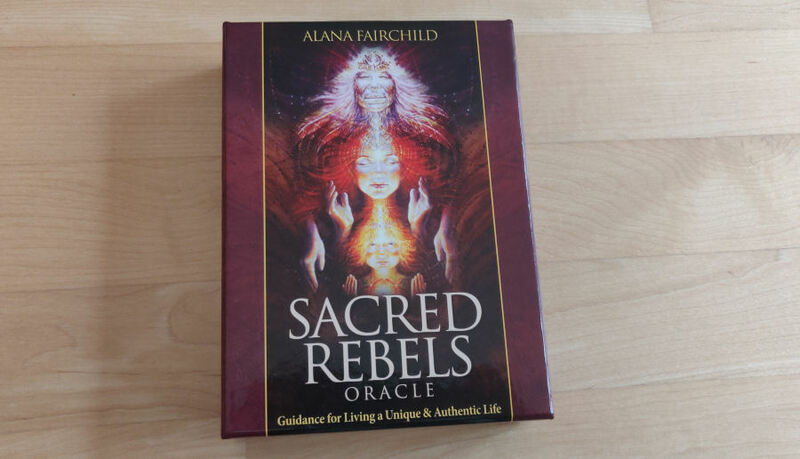 I like Sacred Rebels as an all-purpose general use oracle deck for self-care and celebrating your personal sense of individuality. I love that it’s approachable no matter what walk of life you come from and I did not find this deck culturally appropriative at all. Rather, I found it to be an honest, sincere celebration of cultural diversity, and encouraging all of us to integrate cultural diversity into our personal spiritual paths. The art is evocative of your creativity; the guidance given in the companion book is heartfelt; and I am not at all surprised at how this recipe of aesthetics and New Age spirituality has called to so many. 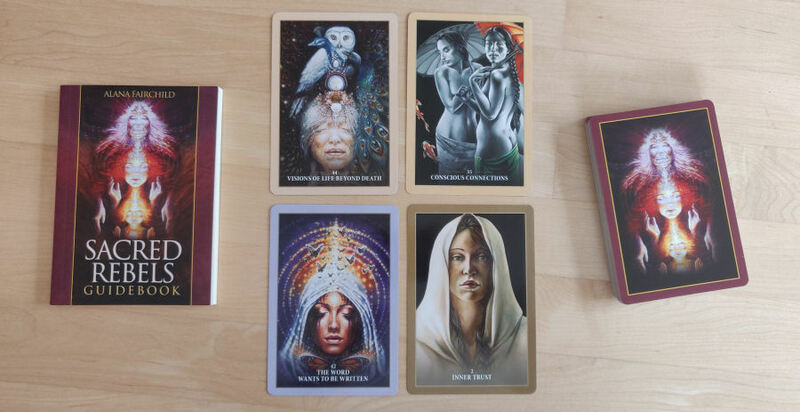 Over the years, I’ve even found myself recommending this oracle deck to many of the clients I’ve read tarot for, because Sacred Rebels is one of those great beginner oracle decks that’s highly effective at helping just about anyone begin the personal journey of trusting their own intuition. Buy the Spirit Keeper’s Tarot, Vitruvian Ed.